We are filling bags of powder on a 6 head filling machine and require to record each bag weight as it comes off the filling machine. At present the incoming data from the RS232 is viewed on a log file as "DD MON YYYY, HH:MM,HEAD NUMBER,HEAD WEIGHT" as it comes in. At the end of each hour, a brief 1 line summary of the production is sent to the log file. We would like to have this data sent directly into a Microsoft Excel spreadsheet. An each weight recorded to be in a row. Each log file for each day to be a new spreadsheet. Each new sheet is to be labeled as the day of the data recording. Typically there will be approximately 1000 recorded data entries for the production for the day. We only require the "date" and "head weight" figure to be inserted into the spreadsheet. The image above shows that the data flow is very simple, where each record has a fixed number of items, where each item is delimited by comma. At the same time the figure doesn't contain non-printable characters and doesn't show ending characters of a data packet. We need to recognize ending characters of an each data record. Please, enable display output for non-printable characters with a character code below than 0x20h. You need to create a port configuration. Please, click the "Plus" button in the main window if you didn't make it before and set the following options. Then click the "OK" button and try to receive the data from a port. You should receive the data like on the figure below. Fig.3. Scales data logger. Data received. We are now ready for configuring of the modules. 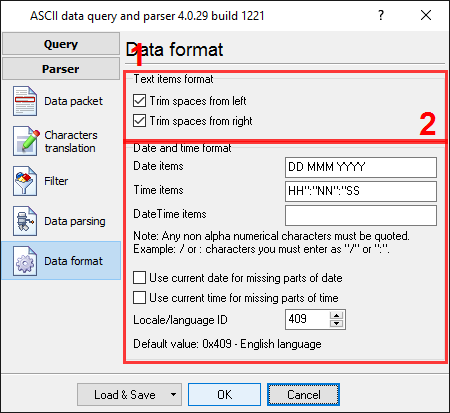 First, select the "ASCII data query and parser" plug-in (fig.4a, pos.1) from a drop-down list. 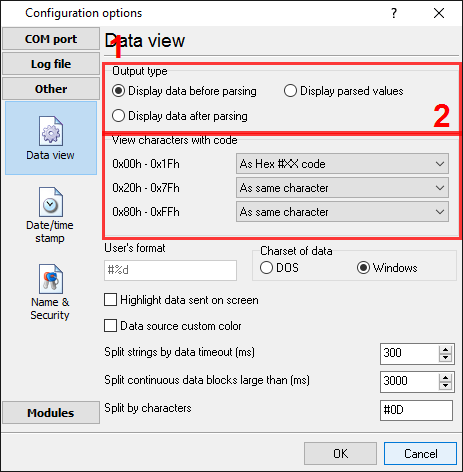 Then, enable a parsing option for data received (fig.4a, pos.2) and select the necessary data export plug-ins. The DDE server (fig.4b, pos.3) will help us to check that the data packet is parsed and exported. The "Local database" plug-in will create Microsoft Excel files. Fig.4a. Scales data logger. Data parser plug-in. Fig.4b. Scales data logger. Data export plug-ins. 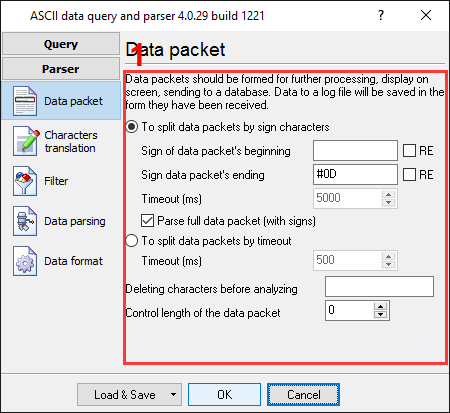 Now, please, open the ASCII parser and query configuration window by clicking the "Setup" button near a drop-down box (fig.4a, pos.1). The dialog window below will appear on the desktop (fig.5). Fig.5. Scales data logger. The parser configuration window. We should filter it. The next page allows you to specify filter rules. You can add new rules by clicking the "Add item" button. In our case we are excluding all data packets that contain string "Hour" (characters case is important in the "Expression" field). Fig.6. Scales data logger. Filter. The next tab is a very important part of the parser configuration. 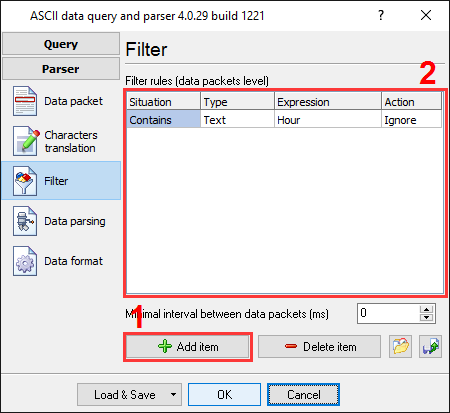 The data parser uses this information for data extraction from the data block. 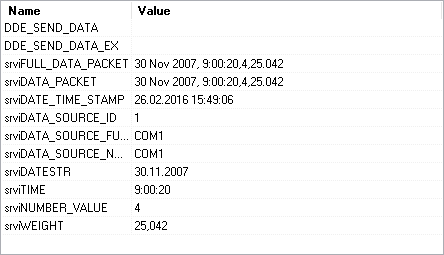 In the example, the data block contains 4 data items (see fig.1) namely: date and time, number value and weight, which should be separated out to different variables. Later, these variables will be used in the data export and will be placed in different columns of our excel file. Fig.7. Scales data logger. Parser items. Any new items may be added by clicking the "Add item" button (fig.7, pos.7). Before adding an item the program will ask you about an item description. You can type any characters here, which will help you to remember a variable's content. For this example all 4 variables with their corresponding descriptions have been added. Ordinal number - all our values are delimited by comma, but just a position of each item is different. You should specify the ordinal number of each value here. All other items have the same parameters, an ordinal number and data type of other. In the next tab, you can specify basic format options as per (fig.8). In this example two variables have "date" and "time" data types. Therefore the first option allows you to convert the date string to a field with the "date" data type. We specified DD"/"MM"/"YY here, according to the specification above. For a detailed description of formatting characters, please, see the help file. The second option allows you to convert the time string to a field with the "time" data type. Fig.8. Scales data logger. Format of items. Other options are unnecessary in our case, because all our items do not have the "datetime" or "string" data type. Fig.9. Scales data logger. DDE server window. 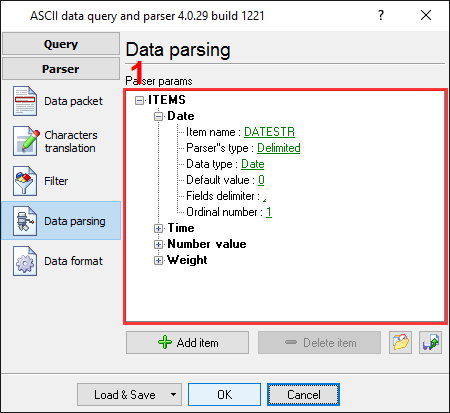 All parser items are now ready for export to an Excel spreadsheet. You can read about it in the second part.